Growing up in the suburbs, just 20 minutes outside of New York City, senior Josh Budzinski was drawn to the calm atmosphere and scenic views of the green mountain state. “I would say this was a change for the better as it helped me appreciate the outdoors more than I already did and gave me copious amounts of land to enjoy how I saw fit,” said the Exercise Science major of his decision to attend college in Vermont. 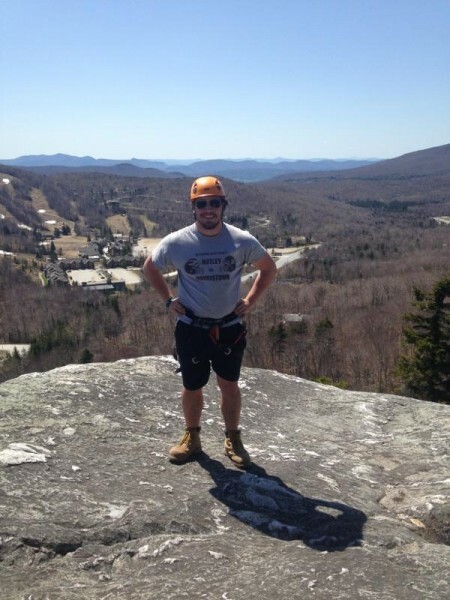 An outdoorsman by nature Budzinski was quick to join the Castleton Ski and Snowboard Club as a first-year student, earning the title of Club President by senior year. Throughout his college years he has also taken full advantage of the many other indoor and outdoor opportunities the rural Vermont location and his Castleton education has had to offer. “I have climbed Mt. Washington, presented at leadership conferences, helped manage a small staff of student leaders, slept outside alone in a stick and leaf hut, and dissected many different things in A&P labs,” he said. Adding to his list of accomplishments during his time at Castleton, Budzinski has also been a Community Advisor, Senior Community Advisor and is a member of the Spartan Marching Band. Being vastly involved in activities both on and off campus, Budzinski recognizes the influence the university and its community members have had on his education, and his future. After graduation he plans to attend Chiropractic school, which he feels the Natural Sciences Department has prepared him for entirely.